Check out the best in family medicine conferences Get the scoop on our amazing keynotes, brand new mentorship program and incredible social events! 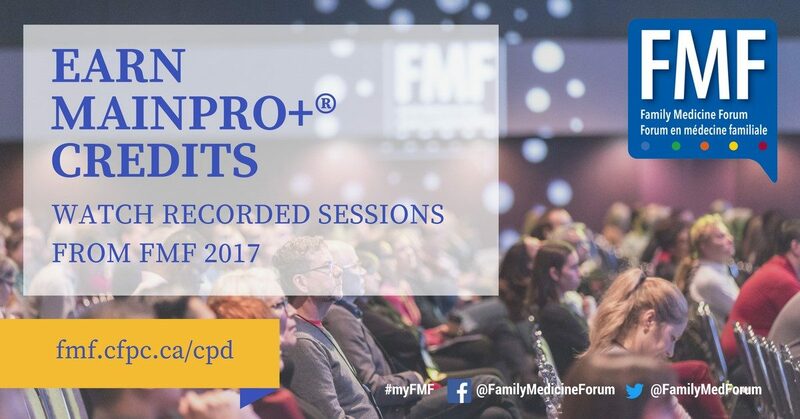 If you missed a fabulous session at Family Medicine Forum (FMF) 2017 or weren’t able to attend last year, you can now catch up on some excellent learning opportunities with our 11 educational videos. What’s even better about this opportunity is that you can also earn Mainpro+® Self-Learning credits! Watching these videos allows you to claim one Mainpro+ non-certified Self-Learning credit per hour of viewing. Please enter your credits as non-certified “online learning” in your Mainpro+ dashboard. If you want to earn Mainpro+ certified credits you can complete a Linking Learning to Practice exercise. Please refer to the Linking Learning webpage for information on how to complete these exercises. "Hi Kevin, unfortunately the live stream is sold ou"
"How do I sign up for livestream. I can't find any"
"Thank you from Spain, José. There's no excuses f"